One of the few competitions in Spring Training was for the fifth infielder position. Manager Cecil Cooper decided that he wanted a backup shortstop who could play other positions, so that he could give Miguel Tejada more rest. That decision – instead of getting a second baseman who could handle other positions, thereby allowing the Astros to plug someone in when Kazuo Matsui inevitably went down to injury – led to a severe mishandling of David Newhan. Newhan, a second baseman by trade, was never really given a chance to fail, despite being better than most of the other candidates. Jason Smith had a torrid Spring and earned the spot. He is now 0-for-2009, and is exhibiting his massively-limited range at second base. Why? Because, surprise of surprises, Kazuo Matsui went down with a bad back. 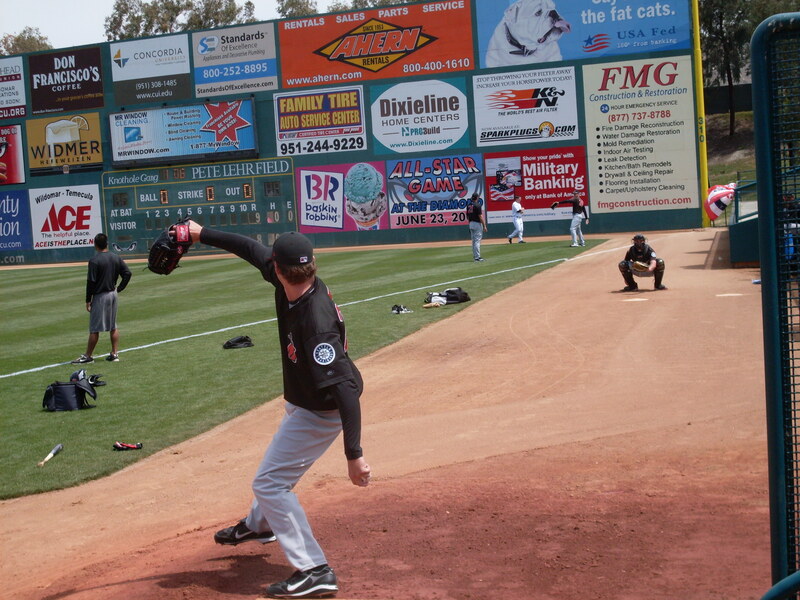 Jeff Keppinger, who is slated to fill in all over the infield, is also out with back woes. Though Drew Sutton might not have been ready to come up anyway, he is certainly not an option now that he has been named as the PTBN in the Keppinger deal. There are no other legitimate second-base options in the system. That leaves Smith, struggling. Exactly as everyone predicted. Oh, and Tejada? No days off yet. Gee, who would have predicted any of that? Oh, right. Everyone. Well, everyone but Cecil Cooper. And for all of this horrible mishandling of such a basic position battle, it was announced today that Cooper would be retained through the 2010 season. Perfect. Houston Astros (MLB) – We all know Wandy Rodriguez can pitch at Minute Maid Park. He had his curveball working today, and allowed just two hits, striking out 10 (including five consecutive) in 7.0 innings and earning his first win of the season. Carlos Lee was 3-for-3 with an RBI, 2 runs, and a walk. Round Rock Express (AAA) – The Express tried their hardest to lose, giving up three runs in the bottom of the eighth, but luckily they’d just scored three in the top of the eighth, as well, and beat the Iowa Cubs (CHC) 7-5. 2 home runs from Reggie Abercrombie and another from Mark Saccomanno paced the offense. Abercrombie went 2-for-3 with 4 RBI, and Saccomanno went 2-for-4 with 3 RBI. Bud Norris made it 5.1 innings, giving up 2 runs on 3 hits and 4 walks to go with his 6 strikeouts. Chad Paronto earned his second save, giving up just one hit and striking out two in as many innings. Corpus Christi Hooks (AA) – The Hooks took a 5-3 lead into the ninth inning, and ended up losing to the Tulsa Drillers (COL) 6-5. Douglas Arguello pitched well, going 5.2 innings with 7 strikeouts, allowing 3 runs on as many hits, along with 2 walks. Paul Estrada made it just 0.2 innings before giving up 3 runs to lose the game. SS Wladimir Sutil had a career night, going 2-for-2 with 2 walks, stole 3 bases, and scored 2 runs. Lancaster Jethawks (A+) – The Jethawks allowed 3 runs in the fifth inning, falling to the High Desert Mavericks (SEA), 4-2. David “The Other David Duncan” Duncan continued to struggle on the mound, with 4.2 IP and 3 ER, raising his ERA on the season to 14.85. Offseason acquisition Chia-Jen Lo threw 1.1 perfect innings in relief, striking out three. The offense sputtered; Jason Castro went 1-for-4 and Koby Clemens went 0-for-1 off the bench. Jack Shuck was the only Jethawk with multiple hits, going 2-for-4 and stealing a base. Phillipe Aumont, who I got on Wednesday throwing a bullpen, threw a perfect 1.1 innings in relief. Lexington Legends (A) – The Legends continued to own the West Virginia Power (PIT), 4-0. Starter Robert Bono didn’t blow anyone away, but allowed just 5 hits and no walks through 6.0 innings to get the win. He’s now thrown 11.0 shutout innings and stands at 2-0. Jack Tilghman pitched the final three innings to earn the save, striking out 4 innings and allowing three hits and no walks. 1B Kody Hinze went 1-for-2 with a home run and a walk. OF Jay Austin finally had a good night, as well, going 2-for-3 at the plate with a walk, a run, and an RBI. He also stole his first base of the season, but also got caught on an attempt. up for lost time by losing two. matter, and thank goodness for that, because ours has been lousy. A team OBP of .272? A team average of .182? These are not good things. A look at the pitching is even scarier. fine. He got to camp late, he went to play for Panama in the WBC. In addition, Berkman (our #3 hitter) and Tejada (who will hit fifth or sixth) are doing just fine. The heart of the order is not the concern, though. Hunter Pence (who would hit 5th in an ideal lineup, but will probably end up 2nd or 6th) is striking out a lot as he works on getting deeper into counts, but he’s getting on base for the most part. Michael Bourn is Michael Bourn – he’s doing better than most of us expected. That leaves Quintero, Blum, and Matsui. Now, we all know that Quintero and Blum would not be starters on most rosters. Blum is an invaluable utilityman who has only had 400+ at-bats twice in his 10-season career. Quintero is an arm behind the plate who has only had more than 150 at-bats once, and that was last season. So it comes down to uncertainty about Bourn’s supposed progress, hope that Lee and Matsui will pick it up in time, and dread over the catcher and third base spots. Simply put, Quintero is not an upgrade to Brad Ausmus, who opted to move out west to be closer to his family. His other option was retiring, so it’s not as if we could have retained him. And I realize he didn’t exactly swing a great stick, but over the past 8 seasons with the Astros, he went .240/.311/.319. Quintero career minor league OBP is .311, there’s no reason to think he can be that productive at the major league level – after he “improved” at the end of last season in August and September after he became more or less the full-time catcher, he scraped together a .306 OBP. Whether anyone wants to admit it or not, among catchers currently in our system, J.R. Towles‘ .302/.386/.476 over five minor league seasons makes him the best offensive option behind the plate, his poor showing in 2008 notwithstanding. That said, we still may be better served going out and grabbing a catcher from outside of our system. Toby Hall‘s injury spoiled things for him, but Johnny Estrada (.277/.317/.400), Paul Lo Duca (.286/.337/.409), and Ivan Rodriguez (.301/.339/.475) are all still available, and neither would cost us a draft pick. Third base is a little bleaker. It should be assumed that Christopher Johnson (.353/.409/.588 this Spring) is going to at least begin the season at AAA Round Rock, but will no doubt find his way to the Show as the long-term solution at third base. Otherwise, he could end up in a position similar to what Towles was handed last year – given the reins a bit too early and written off once he’d failed as a result. There’s no help in free agency, unless you were to shift Tejada to third (where he played in the WBC), Matsui to shortstop (where he played before switching positions with Jose Reyes in New York), and getting either Ray Durham or Mark Grudzielanek from free agency. That seems unlikely, so I suppose we’ll have to dig in and wait for the Chris Johnson era to start. I’m cautiously optimistic that that could happen as early as May. A word of caution, however, as Johnson’s minor league line (.266/.304/.395) is actually worse than the last promotion-from-within at third base, Morgan Ensberg‘s (.271/.381/.472). Ultimately, Ensberg lost all confidence at the plate, but let’s remember that he did give us three very solid years at the big league level – 2003, 2004, and 2005 – before his collapse. Even 2006, the beginning of his “downturn”, he boasted a .396 OBP and a .463 SLG. Free agent pitchers are less of a sure thing. If we were going to enter the market, we’ve missed the window. All that’s left are a few reclamation projects: Pedro Martinez, Mark Mulder, Ben Sheets, Kenny Rogers, Curt Schilling, El Duque, Sidney Ponson. Upgrades over Mike Hampton and Brian Moehler? Possibly. But it’s unlikely we’d sign any of these guys, and I can’t really blame the FO for passing on them. All told, it will be interesting to see how our team comes together. If they come together. At this point in Spring Training, the positives are few, but they exist. And honestly, if it means that money goes into development and signing draft picks, I’m okay with no moves being made. Let’s just hunker down and see if we can’t lose us some games! Yankees superstar Alex Rodriguez will probably require surgery. When that surgery is going to take place seems to be the only consideration. With a fairly long recovery time, the Yankees are stuck with a third baseman who will be limited if he plays in the field, and DH is not necessarily an option, depending on whether or not Jorge Posada can catch. Might the Yankees be interested in doing the same thing? At some point – probably 2010 – Tejada is likely to become an everyday third baseman if he wants his Major League career to continue. The Yankees, if they were to lose Rodriguez’s production at third, suddenly find themselves behind the 8-Ball. There aren’t many third basemen who would even approach Rodriguez’s numbers. Though Tejada isn’t quite A-Rod at the plate, he’s a much better option than any currently-available free agent third basemen, and he comes with just one year left on his contract. Many opinions are floating on the best way to replace Rodriguez, should the Yankees opt to do that. One of the more intriguing ones has 2B Robinson Cano moving to third base, and the Yankees acquiring either a free agent second baseman like Mark Grudzielanek or Ray Durham, or trading for a second baseman. Popular opinion puts Florida’s Dan Uggla at the top of this list. But Uggla’s likely to come with a high price tag. The Marlins covet prospects, and the Yankees have quite a few that may interest them. Pitchers Phil Hughes and Austin Jackson are commonly referred to. What I wonder, though, is if Tejada might entice the Bronx Bombers as an option. His albatross contract, which is currently strangling the Astros’ payroll, would be a drop in the bucket to the Yankees. He provides good defense and a solid bat for their lineup, and would no doubt cost less in prospects than would Uggla. The Astros’ needs are simple, and they begin with starting pitching. In 2008, the Scranton-Wilkes Barre Yankees had a nice crop of pitchers that helped them place first in the North Division of the International League: Hughes, Jackson, Kei Igawa, Daniel McCutcheon, Ian Kennedy, Jeff Karstens. The list goes on, but that is a group of pitchers who logged at least 60 innings with ERAs under 4 and WHIPs under 1.20. Assuming that the Astros want a pitcher on the younger side, under the age of 28, McCutcheon, Kennedy, and Karstens have to look mighty enticing. Unfortunately, McCutcheon and Karstens were sent to the Pirates in the Xavier Nady–Damaso Marte deal in July. That leaves Ian Kennedy, as well as some more marginal options, including 24-year-old righty Jeff Marquez, Alfredo Aceves, Phil Coke, and Zachary Kroenke, as well as youngsters Dellin Betances, Zachary McAllister, and Mark Melancon. You can almost pick and choose any two on the list, though it’s highly unlikely the Yanks would part with Coke, who figures to be a big part of their bullpen at some point this year. Melancon, who spent time in A+, AA, and AAA ball in 2008, combined to go 8-1 with 3 saves in 95 IP, 2.27 ERA, 0.958 WHIP, 89 K, 22 BB. In my eyes, he’s easily the most intriguing option. He’ll be 24 this year, and could make a case to break into the Astros’ rotation if things falter and he stays on his current path. The Astros would also likely want a pitcher who could pitch in the majors this year as a starter, which would be questionable for Melancon, but the Yankees are short on pitchers they might actually deal. Certainly, they won’t be giving away C.C. Sabathia, Joba Chamberlin, Andy Pettitte, A.J. Burnett, or Chien-Ming Wang without a return greater than Tejada. But what they might part with is a non-roster invitee like Brett Tomko. Tomko would be someone who might pitch a little bit at the big league level until Melancon is ready, probably in 2010. Because Ransom would primarily be a bench utilityman, Tomko is a flyer, and Melancon would probably need time to develop, the Yankees would have to add another prospect – perhaps switch-hitting second baseman Reegie Corona – to sweeten the deal. So there you have it: Tomko, Melancon, Ransom, and Corona for Miguel Tejada. Certainly a fair deal for the Yankees, and the Astros receive some prospects and some middling major leaguers, while ditching Tejada’s contract. The Yankees get a proven hitter who can play third base and not require them to move their established infielders around, and it would cost them a lot less than Uggla would. Sounds like a plan; let’s make it happen. But to be fair, I’m a guy who started a blog primarily to explain the Rule 4 Draft. I’m still finding my voice, and I expect to be completely awkward and long-winded and sing-songy and condescending and impossible to relate to most of the time. Much like Bobby Jindal’s Republican Response last night, come to think of it. Seriously, did anyone else think he was going to try to sell them a ShamWow? Yesterday, final rosters were announced for the World Baseball Classic. Ah, the World Baseball Classic. Just the name takes you back to the Golden Age of Baseball… 2005, when Bud Selig announced that there would be one and no one had any idea how it was going to be organized and put together competently in such a short amount of time. Bud quickly answered that the way he answers most questions: It wasn’t. Three years after the first Classic and we’re on the verge of its sophomore effort. Surely, you must have thought, the process has been cleaned up since then. Think again. And don’t call me Shirley. The Dominican Republic, which finished fourth in 2006, is going into this year’s edition of the WBC as one of the favorites to win. That’s why I was a little surprised when their roster was announced and an aging, fading veteran shortstop was added, behind two of the human race’s best shortstops in Hanley Ramirez and Jose Reyes. Hey, I thought, that’s my aging veteran shortstop with diminishing power numbers, fading durability, and an increasingly-suspect glove! Well, not mine. But the Astros’. And they’re mine; I claimed them off waivers. It didn’t seem to make a lot of sense for Tejada, who had to “re-dedicate” himself to conditioning this offseason… whose manager has said that he’s going to work to give more rest this year to keep him fresh… who is facing impending legal issues and has enough distractions… who was at best the third-best Dominican shortstop on the roster (Cano used to play a decent shortstop in the minors, you know)… to play in the World Baseball Classic. He has a job to do, and hasn’t exactly put himself in a position to look like he’s not working toward that goal. The Astros sold the farm and took on his albatross contract. He isn’t exactly Carlos Lee or Roy Oswalt – guys who do the job they’re here to do, and who have relatively few question marks. Then, this morning, news came that Tejada, like seemingly half of the Dominican roster, will be opting out of the Classic. According to this article by Alyson Footer, it wasn’t because he wanted to dedicate himself to winning over the Houston Astros fans who feel cheated by the deal that sent Matt Albers, Luke Scott, Dennis Sarfate, Michael Costanzo, and perhaps our only legitimate pitching prospect, Troy Patton, to the Orioles last offseason for Tejada, who was then outted for lying about his age, struggled through a long season slump that left many fans questioning his abilities (he finished .283/.314/.415 with just 13 home runs), and then followed it up by admitting he lied to a federal investigator about a teammate’s steroid use. No, that’s not why. Rather, it’s because they might have wanted him to move to first base. that I’m not, it’s good to let somebody else play. I want you to re-read that. I heard from somebody that they’re going to make me play first base or another position. Okay, I get it. You have Hanley Ramirez and Jose Reyes. They are both better shortstops than Miguel is. But first base? Is someone who has played 1,832 professional games – all of them at shortstop (not counting 23 games as a DH) – the best the mighty Dominican Republic can do at first base? I understand Albert Pujols and Carlos Pena can’t play; and that David Ortiz is a fat tub of goo whose range almost approaches my own grandmother’s; but Miguel Tejada at first base? Why not Placido Polanco or Jhonny Peralta? Heck, why not Francisco Liriano, at that point? But what concerns me the most is the way Tejada phrased it: “I heard from somebody that they’re going to make me play first base…” He heard from somebody. Not from Felipe Alou, I’m guessing, or from anyone on the Dominican coaching staff. Then he would have said, “They told me that they want me to play first base.” Not I heard from somebody. Not They’re going to make me. Not First base or another position. Couldn’t someone pick up the phone and call the guy? Ask him if he’d be interested in playing first base? Tell him where they’d like to use him? You just put him on the roster and try to let him figure out where he’s going to be playing? Man, this WBC sure is exciting!